The show must go on. Despite that fact that actor and writer Carrie Fisher died on Tuesday, December 2016, the late great actress and writer will be in a couple of upcoming episodes of the Family Guy TV show on FOX. Variety confirmed Fisher had completed two new episodes, prior to her death. Fisher has guest starred on the animated FOX comedy since 2005. She voiced Angela, Peter’s (Seth MacFarlane) brewery supervisor. The Family Guy TV series voice cast also includes Alex Borstein, Seth Green, Mila Kunis, and Mike Henry. The Late Carrie Fisher Will Be in Two Upcoming episodes of Family Guy. While the report states, “[Fisher] voiced the character in 20 episodes that have aired, most recently last season in an episode that premiered Jan. 3…” that does not square with Fisher’s IMDb profile. The latter currently credits Fisher with 23 episodes of Family Guy, the latest of which, “Carter and Tricia,” aired on December 4, 2016. Last week, Fisher suffered her eventually fatal heart attack, while returning from UK, where she had wrapped production on Catastrophe, season three. That live-action comedy streams on Amazon in the US and airs on Channel 4 in UK. Read Catastrophe co-creator and star Sharon Horgan’s remarks on Carrie Fisher’s passing. The upcoming dates of Fisher’s return to Family Guy have yet to be announced. When we know, you will. What do you think? 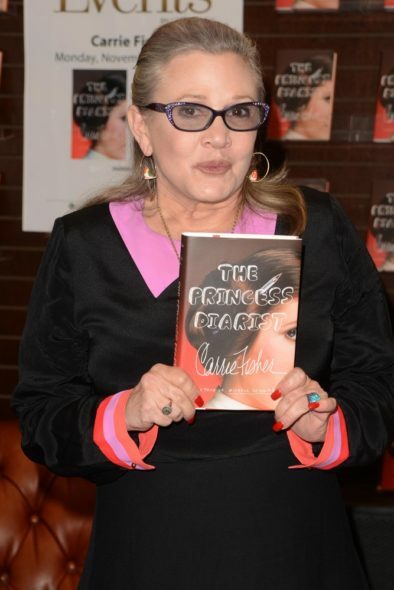 Are you a Carrie Fisher fan? Will you watch her upcoming episodes of Family Guy on FOX? Let us know, below. More about: Family Guy, Family Guy: canceled or renewed?, FOX TV shows: canceled or renewed? Family Guy: Is the FOX TV Show Cancelled or Renewed for Season 15?